Chinese mobile phone maker Xiaomi has responded to Apple's iPhone 7 with the launch of a pair of new high-end smartphones. The two handsets succeeding the company's flagship Mi 5 phone are called the Mi 5s (5.15-inches) and the Mi 5s Plus (5.7-inches), the latter featuring dual cameras as per Apple's own 5.5-inch Plus device. The 12-megapixel cameras come with an f/2.0 aperture, dual-tone LED flash, phase detection auto-focus, automatic HDR, and video recording of up to 4K resolution at 30fps. Both phones have a 1080p display and a fingerprint scanner under the front glass, which Xiaomi says "recognizes a 3D map of each user's fingerprint through ultrasonic waves", so no physical button is needed. The use of ultrasonic is also said to tolerate dirty fingers better than the capacitive sensors found in Apple's devices. Both dual-SIM handsets are also powered by a Qualcomm Snapdragon 821 processor, but the Pro is clocked higher and has 6GB RAM and 128GB storage, whereas the Mi 5s features 3GB RAM and 64GB storage as standard, with 4GB RAM and 128GB storage as optional add-ons. 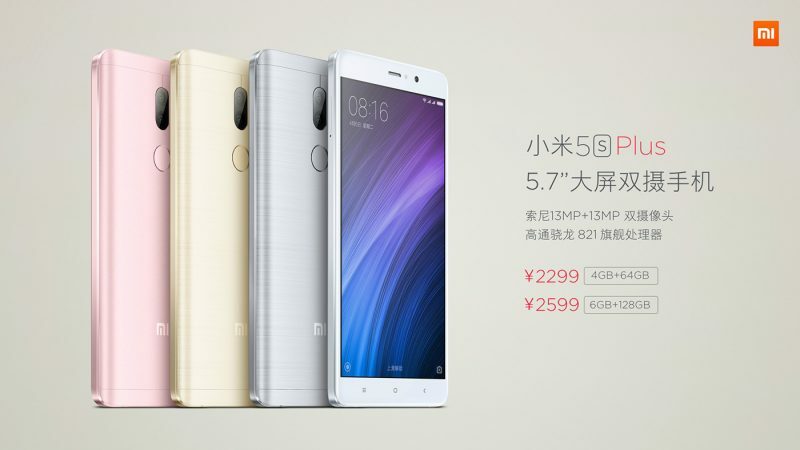 Similarly, a higher spec Mi 5s Pro is available with 6GB RAM and 128GB storage. The phones will be available in China from September 29, with the Mi 5s priced from 1999 RMB ($299) and the larger Mi 5s Plus costing upwards of 2299 RMB ($345). There's no word yet on when the phones will become available in other regions. Android is Android, but at least this thing has better specs than the Note 7, costs half the price, and shouldn't explode (I guess). If you are going Android, better go full Android. Finger print scanner is interesting. Phone looks about 2 iPhones thick. This was a good thing to steal from Apple at least. I did like the original marketing photo showing all of them at once. I don't really care if they're using the iPhone as an inspiration or whatever. Imitation is the sincerest form of flattery. Yeah? You think they bought the iPhone 7 and reverse engineered the technology in less than 3 weeks? How about using the 5S logo for a start? We'll ignore the Plus name stealing, they've actually just flat out copied the trademarked S in a box logo for Apple's S phones. You can't do that. Next year available in matte black and gloss black by any chance?